Water Cannon’s newest product for the hand-held commercial pressure washer industry is a lightweight, compact electric pressure washer. Water Cannon designed this model for durability, performance and affordability. Built with all-aluminum aircraft commercial-grade stock, the frame comes with a lifetime guarantee and dissipates heat, helping the unit to run cooler. This heavy-duty frame is resistant to chemicals and corrosion. The unit’s compact unitized size enables it to fit anywhere without taking up a lot of space. It produces 2 gpm at 1,500 psi. 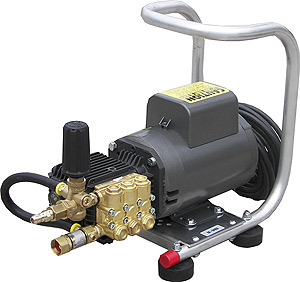 Because of its size and performance, it can offer continuous-duty jetter operation for runs involving up to 150 feet or 3-inch pipe diameter. Standard features include overheat thermal protection, thermal relief valve and bypass protection.